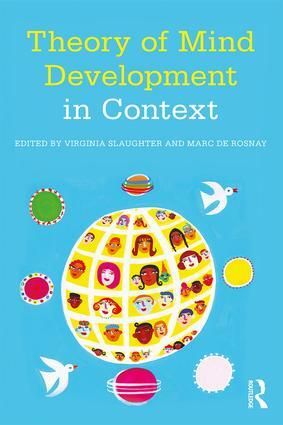 Theory of Mind Development in Context is the first book of its kind to explore how children’s environments shape their theory of mind and, in turn, their ability to interact effectively with others. Based on world-leading research, and inspired by the ground-breaking work of Candida Peterson, the original collected chapters demonstrate that children’s understanding of other people is shaped by their everyday environment. Specifically, the chapters illustrate how theory of mind development varies with broad cultural context, socioeconomic status, institutional versus home rearing, family size, parental communication style, and aspects of schooling. The volume also features research showing that, by virtue of their condition, children who are deaf or who have an autism spectrum disorder function in environments that differ from those of typical children and this in turn influences their theory of mind. Although much important research has emphasized the role of nature in theory of mind development, this book highlights that children’s understanding of other people is nurtured through their everyday experiences and interactions. This perspective is essential for students, researchers, and practitioners to gain a complete understanding of how this fundamental skill develops in humans. The book is invaluable for academic researchers and advanced students in developmental psychology, education, social psychology, cognitive psychology, and the social sciences, as well as practicing psychologists, counselors, and psychiatrists, particularly those who deal with disorders involving social and/or communicative deficits. Virginia Slaughter is Professor and Head of the School of Psychology at the University of Queensland, Australia. Marc de Rosnay is Professor and Academic Head of Early Start at the University of Wollongong, Australia.